Easter is the most important festival in the Christian church year, but what is Easter? It begins with Good Friday. Christians are convinced by trust and acceptance that the Romans killed Jesus Christ in Jerusalem about two thousand years ago. They believe in the Resurrection of Jesus Christ on the third day after his Crucifixion. Religion is important but there are other important traditions associated with Easter holiday time, as well. The foundation of this belief is the significance of resurrection, re-birth, new life and fertility. This is the reason why the Cross, Easter eggs, Easter rabbits or hares (Easter bunnies) and Spring have evolved over the centuries as symbols of mythological and religious faith in the context of Easter. In fact one of the ancient fables about Easter eggs is that the Saxon fertility goddess Eostre (or Ostara) endowed upon the rabbit or hare, the ability to lay eggs in all the colours of the rainbow. Springing into life, following a harsh and lifeless Winter, has a deep primeval significance. The pope also officially decreed that women -- previously barred from the ceremony -- would now be included. Hot Cross Buns were probably originally used in ceremonies and rituals and the Christian Church attempted to ban the buns, although they proved too popular. Left with no alternative but defeat, the church did the next best thing and Christianised the bread with Queen Elizabeth I passing a law, which limited the bun's consumption to proper religious ceremonies, such as Christmas, Easter or funerals. Commercialisation of this festival followed soon afterwards, evolving into the multi-million pound industry it is today. 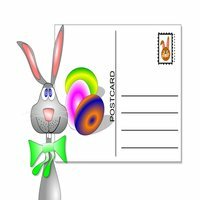 This includes the sending of various types of Easter cards; Easter cards for kids, religious Easter cards, funny Easter cards and happy Easter cards, to name but a few. Easter holiday cards are popular, not only in Britain but throughout the world. The concept of greeting cards are said to have started with the ancient Egyptians who exchanged wishes in the form of personal notes on simple slips of papyrus. It is interesting that ancient Greek and Chinese cultures ‘invented’ similar communications around the same time. All these were the fore-runners of the handmade paper greeting cards, which had become a popular means of communicating good wishes by the early 13th century. The invention of the postage stamp, the penny Black, introduced in 1840 in Great Britain, was the catalyst for this phenomenon. It immediately turned the greeting card into a popular mode of sending personal messages, spring boarding Easter post into commercial production on a massive scale. Greeting cards began to be created for a number of occasions. Easter was mainly seen as a religious festival and the use of greeting cards was not proven popular until the late 1890s. Easter greetings cards were literally conceived in Europe when a stationer in Victorian England added a greeting to a drawing of a rabbit. It gave birth to the modern Easter holiday greeting card adorned with symbols related to the occasion such as chickens, eggs, rabbits, the Holy Cross etc. Today, greeting cards have become a popular medium to express blessed wishes at Easter. Easter is now the fourth most popular holiday in terms of sending cards, ranking just behind Christmas, Valentine's Day and Mother's Day. What would be the point of sending Easter Cards without having a letterbox of your own? What would be the point of sending Easter Cards without having Postbox Shop? Postbox shop is probably the only on-line supplier of postboxes and mailboxes not supplying goods imported from the Far East. Postbox Shop will only source their products from reliable manufacturers in the UK and Europe where we can guarantee that only the finest materials are used. We will not import and supply the inferior goods from the Far East that are readily available in today’s market on other websites and retail outlets. You can be assured that you only receive products of the finest quality. Most of our products comply to BS EN:13724 and Secured By Design New Homes Guide 2014. Postbox Shop can cater for all styles and tastes whether you require a traditional or modern postbox, we have the solution. Our range of postboxes is constantly changing to meet the publics needs and demands to ensure that Postbox Shop remain the No 1 supplier of post and mailboxes in the UK. As well as our extensive range of individual boxes we can supply postboxes for commercial buildings and apartment blocks. Does this tempt you to be adventurous, by purchasing a unique letterbox painted in a colour of your choice? Take a look at our custom painted letterboxes at Postbox Shop. Exclusive at PostBoxShop, you can now design and order your own letterbox. First choose a custom letterbox, choose a combination of colours to match your ideas, (building colour scheme, corporate or organisation colours, or just something unique! ), and we will ship your unique letterbox within 2-3 weeks.